What strikes you first about the Gordon Giltrap Deluxe is that it oozes a sense of quality. This image starts straightaway with the classy-looking ‘Gordon Giltrap Signature’ crocodile skin style hardshell case. 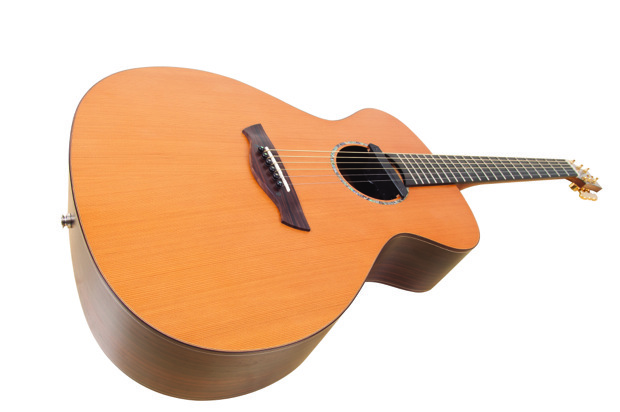 Once this is opened you find an intriguingly-shaped guitar, with a very wide lower bout contrasting its narrow waist, and a stylish-looking, satin-finished solid cedar table – that gives it a much more sophisticated understated look compared to the high-gloss finishes often found in this price range. Rosewood back and sides, with a mahogany neck, ebony fingerboard and bridge, and gold Grover tuners complete the high-end look, and all combine to suggest a guitar of some distinction. 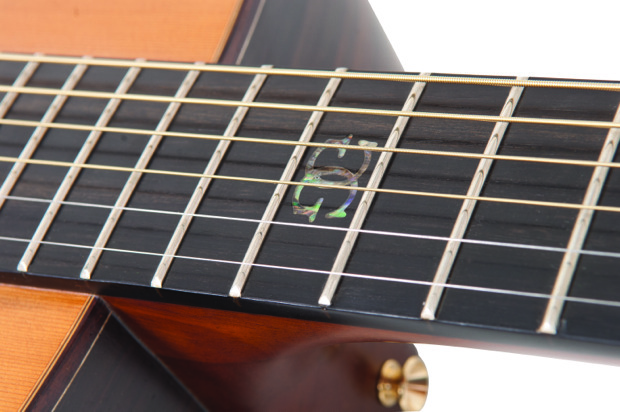 Further inspection reveals a very welcome Fishman Rare Earth Blend pickup system which, in addition to the magnetic pickup mounted across the soundhole, also incorporates an adjustable microphone inside the guitar, with a fingertip control that allows you to blend the two sources. The review model that I tried was beautifully set-up and a joy to play. It seemed as equally at home with intricate fingerpicking as it was with chordal strumming across the fingerboard. Even using dropped tunings, there were no buzzes or rattles. The tone was quite strong and clear, with notes well-balanced and easily articulated, whilst chords sounded bright and projected quite well. Getting the best result out of the pickup system requires some degree of experimentation and using the in-built microphone alone can lead to a rather boxy sound unless you take time to adjust the microphone positioning to suit your playing style. My preference was to use a mostly pick-up blend. Whilst the best part of £700 cannot be described as “cheap,” there is no doubt that this guitar is great value for money and everyone I showed it to guessed that its price would be somewhere between £800 and £1,400. As its name suggests, it really does look and feel like a ‘deluxe’ guitar. Undoubtedly, the input of renowned luthier Rob Armstrong and legendary player Gordon Giltrap, have played an important part in making this such a quality and easily-playable guitar. Overall: 92.5% – a guitar of some distinction. 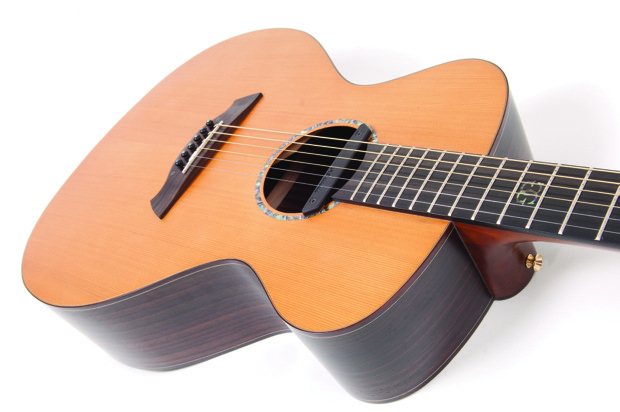 This entry was posted in Acoustic Guitar Reviews by Alan. Bookmark the permalink. I have the 12-string standard version, and have to say that I think this is one of the best “affordable” guitars on the market. Mine did have a slight issue with the string spacing, but a little manoeuvring and a piece of sandpaper soon fixed that. The amplified sound on the standard version is extremely good, although as you say, it takes a wee bit of fiddling (I guess it’\s all personal taste!) so the addition of the pickup will be a bonus. I’m hoping to pickup one of these in the near future. It might not be in the same class as some other guitars, but at this price (it’s being sold at £549! ), it can’t be sniffed at!